Another magical day in Tiruvannamalai. My Sadhu friend Shiv met me in town and walked me the backwoods path to meet with several other Sadhus. 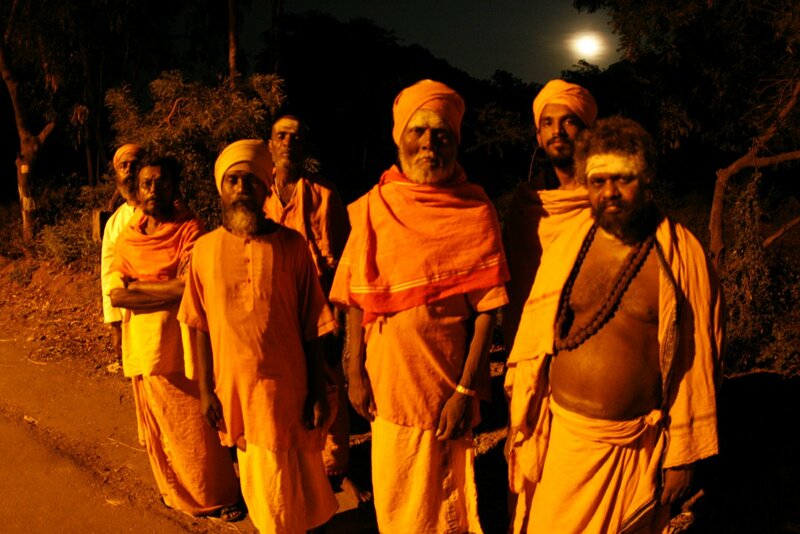 They are basically renunciates of working society and have decided to live the life of a mendicant, sleeping outdoors or in temples, asking for alms, and generally leading a very religious life. The definition from Wikipedia is: In Hinduism, sadhu is a common term for an ascetic or practitioner of yoga (yogi) who has given up pursuit of the first three Hindu goals of life: kama (enjoyment), artha (practical objectives) and even dharma (duty). 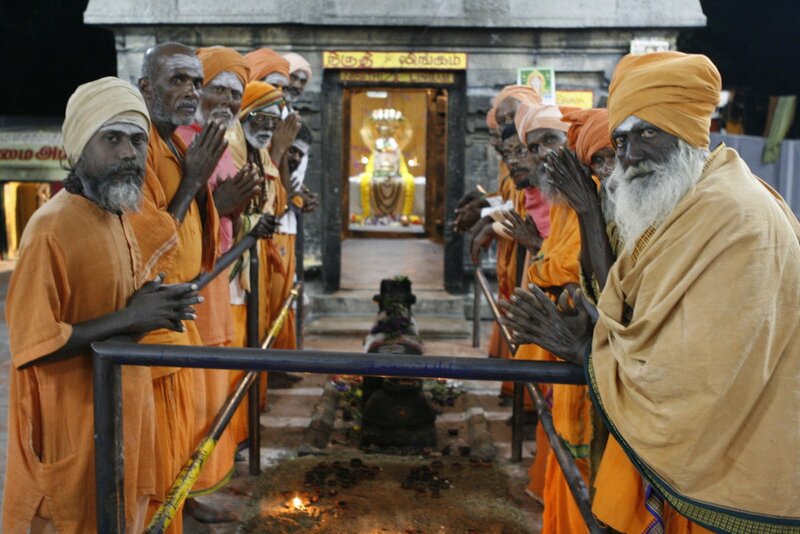 The sadhu is solely dedicated to achieving moksha (liberation) through meditation and contemplation of God. 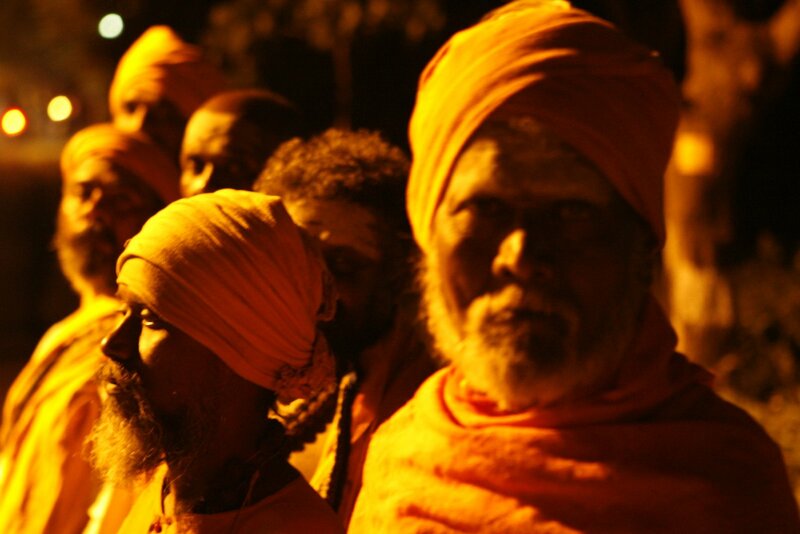 Sadhus often wear ochre-colored clothing, symbolizing renunciation. Last night, he introduced me to his 4 main Saddhu friends he lives with, and then we went out for tea together and did some photographs by the streetlamp lights. We just hung out together while I asked some questions and they did the same. We went on to a temple where he gathered more together for a larger photoshoot. It was fun. Today, I think I’ll start the interview part and hopefully do some photos during some better daylight. I feel honored to be being brought into the inner lives of these people. I realized last night why I could never be a Sadhu, at least not yet, and that is a deeper yearning within myself to be special, to stand out in some way. I’m not saying that’s good. In fact, I actually believe it is something to overcome. This pesky narcissism rears it’s head here in India and is forcing me to look at it. I hate it, but I think it’s an important piece of inner work for me to do, which may actually take this entire lifetime, but it’s on the agenda for certain. It’s your job to be you-full time.